As a teenager, you have a flawless skin that you are very proud of. You can get a pimple but it won't stay long and you are back to your normal self. This experience is not familiar to some people because they are lucky enough to cheat nature. While the others are so familiar with this, they have used every product in the markets and also homemade remedies but still no results. So in today's article I'll be talking about how to get rid of acne overnight. To get rid of that pimple, break open a capsule of vitamin E and rub it on your pimple. Leave it for 10 minutes or overnight, but the vitamin will keep the area moisturized while decreasing any redness and irritation. Also, it will unclog pores and prevent breakouts if you use it regularly. You can also take vitamin as a supplement but rub it in for the best results. If your skin gets irritated, stop it immediately. Popping your pimples is very bad but popping might be the only way to get the swelling to go down. If you want to pop a pimple, make sure you use an extraction tool and be very careful. Find an acne spot treatment that is best for your skin, this will also make your pimple disappear. Ice helps you reduce redness and inflammation. Wrap an ice cube in a piece of fabric and hold it against your pimple. Place the ice for about 10 minutes. Mix one part apple cider vinegar with hone part eater before going to bed. Dip a cotton ball in your mixture then apply it on your pimple and put a band-aid over it. This will make it look smaller. That is all for now. The above tips have helped me a lot and I couldn't wait to share it with you guys. like they say prevention is better than cure. If you have acne (pimples) yet, then you're lucky and you'd want to know how To Prevent Acne (Pimples). 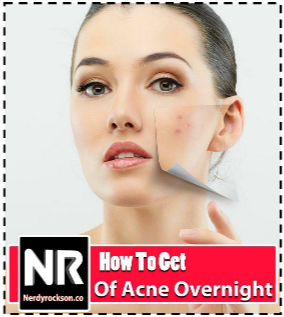 If you have any tip on how to get rid of acne overnight, don't hesitate to let us know at the comment section. 0 Response to "Guest Post: How To Get Rid Of Acne Overnight"